NORTH BILLERICA, Mass. - In a best-of-three series very rarely does game two go like game one. The loser adjusts, comes out with added fire, and the pace of the game changes as the second game progresses. Central Catholic wanted none of that. Fresh off a dominant 5-0 win game one over Pope Francis, the Raiders made game two nearly identical, as they pounded the Cardinals 5-1 at the Chelmsford Forum to sweep their Super 8 quarterfinal series to reach the program’s second Super 8 semifinal, and first since 2012. Like in game one, things began slowly before the Raiders lowered the boom late in the first period. Steve Birch was in the right place to tip in Central’s first goal with 4:18 left in the first and it was all Raiders from there. Just over three minutes later, Pope Francis goalie Zac Steigmeyer lost control of a shot and Central’s Matt O’Rourke was right on the doorstep to slam home the loose puck. Steigmeyer was replaced by sophomore Zac Roncarati, who started game one, at the start of the second period. Things didn’t change with Roncarati in cage. A goofy bounce off the skate of Cam Stanisewski pushed the lead to 3-0 for Central late in the second as everything seemed to go Central’s way. Two more goals, from Eric Lester and Thomas Manty, in the third period rounded out the scoring. Eleven Raiders registered a point against the Cardinals. Manty and O’Rourke were the only Central players with multi-point games. Each had an assist in addition to their goal. With the offense rolling, sophomore goalie Matt Pasquale played it cool in cage for the Raiders. Despite fighting a flu all week, including running a fever over 101 degrees, Pasquale looked sharp all night stopping all 18 shots that came his way. Pasquale was aided by a strong defensive effort that shut down a Pope Francis attack led by the likes of Jon Tavella and Cam Peritz. The Raiders now look ahead to their semifinal date with either Walpole or BC High. 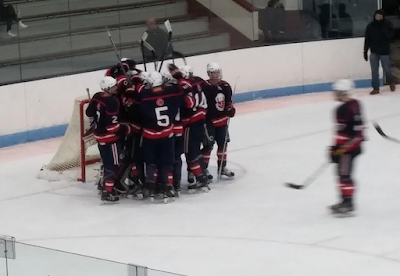 BC High defeated Walpole 2-0 in the second game of their series just after Central clinched their spot in the semis. In 2012 the Raiders were beaten in the semifinals by Malden Catholic, 4-0.